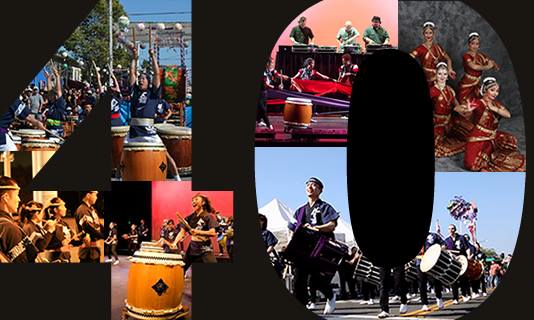 SAN JOSE — San Jose Taiko concludes its 40th anniversary season with a concert performance that includes fan-favorite SJT classic arrangements as well as some world-premiere compositions. Special guest artist Abhinaya Dance Company of San Jose will join SJT on stage for a portion of this program. Also, witness the debut performance of one of the largest taiko in North America. Since 1973, SJT has been sharing the art of taiko with audiences locally, nationally, and internationally. With a deep respect of cultural traditions and a commitment to artistic excellence, SJT is dedicated to the advancement of the taiko art form through the development of its world-class Performing Ensemble and the San Jose Taiko Conservatory. Special anniversary events over the past year included Day of Remembrance (Feb. 17), Nikkei Matsuri (April 28), 40th Anniversary Dinner (May 10), SJT x The Bangerz in Concert (June 15), SJT exhibit at Japanese American Museum of San Jose (July 13), San Jose Obon (July 13-14). The concert takes place Saturday, Oct. 5, at 8 p.m. at Center for the Performing Arts, 255 Almaden Blvd., San Jose. Presale tickets, available until 8 p.m. on Friday, Oct. 4, are $25 general, $20 for students and seniors (65 and over). Tickets at the door are $30 general, $25 for students and seniors. For more information, call (408) 293-9344 or email [email protected] To purchase tickets online, go to www.taiko.org.